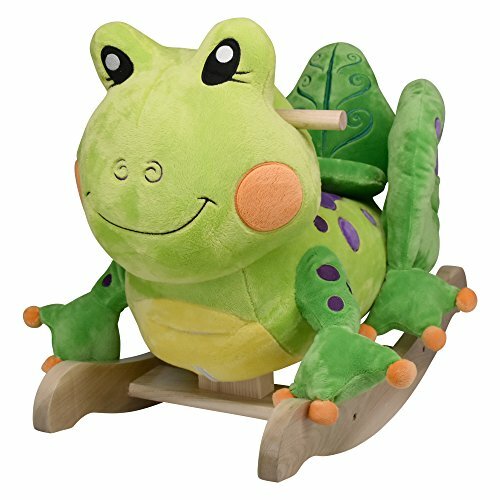 Hop along on this whimsical rocking frog! Brightly colored and full of hidden activities like rattles in his orange toes, musical Fergie features endless fun. Located on the back of the head, baby will find 4 shaped buttons that activate original songs that teach ABC's, 1-10, colors, shapes and more. Complete with a sturdy padded seat, natural wooden base, and easy grip wooden handles, Fergie is sure to be baby's favorite!. If you have any questions about this product by Rockabye, contact us by completing and submitting the form below. If you are looking for a specif part number, please include it with your message.